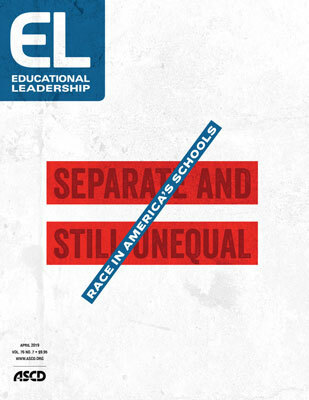 Subscribe to Educational Leadership® magazine. Save up to 51% off the cover price! 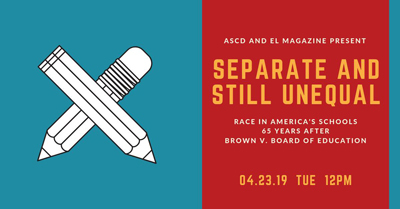 In recognition of the 65th Anniversary of the landmark Brown v. the Board of Education decision, ASCD will host a D.C.-based panel discussion exploring challenges and opportunities surrounding race in U.S. schools today. The panel has sold out but you can follow the discussion online. ASCD will live-tweet the event @ASCD, @ELmagazine, and #ASCDBvB on Tuesday, April 23. Jill Harrison Berg, a leadership coach and school improvement consultant, shares approaches that all leaders can use to help students of color. Educational Leadership magazine is ASCD's flagship publication. With a circulation of 135,000, EL is acknowledged throughout the world as an authoritative source of information about teaching and learning, new ideas and practices relevant to practicing educators, and the latest trends and issues affecting prekindergarten through higher education. Explore timely content from ASCD.